A stylish venue with a creative menu and specials each weekend. 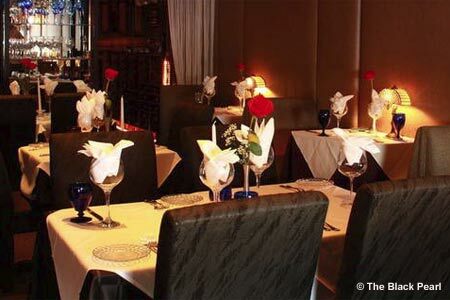 : This cozy 38-seat restaurant features an Art Deco décor that complements the intimacy: dim lighting, candles on the tables, fresh roses, white tablecloths and Depression glass. The limited but creative menu includes twice-cooked Long Island duck, the leg slow-braised and the breast grilled with a spiced fruit demi-glace. Veal paillard comes with a vanilla bean sauce with wild mushrooms and Marsala. New Zealand rack of lamb is prepared with a citrus mustard and fresh herbs. Try the Falling Hot Chocolate Cake for dessert (if available), which must be ordered at least 20 minutes in advance. And, of course, at meal's end there are tiny "black pearl" house-made licorice candies for a sweet finish.